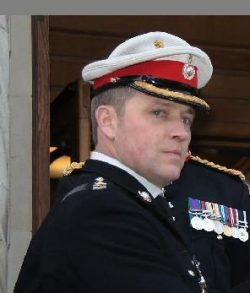 Members of the Southfields-based Royal Marines Reserve unit paraded Wandsworth town centre on Saturday (Jan 28) as part of the celebrations to mark being awarded the Freedom of the Borough. Members of the Royal Marines Reserve (City of London), whose headquarters are in Merton Road in Southfields were conferred with the honour by the Mayor of Wandsworth Cllr Richard Field in celebration of their links with Wandsworth.To mark the occasion, 160 reservists, veterans and cadets headed by the Band of the Royal Marines took part in a special parade through Wandsworth Town to the town hall, where they were formally offered the Freedom of the Borough. Hundreds of local people turned out to cheer them on. The Unit’s volunteers are not just part-time soldiers, but fully trained elite Commandos, Volunteers were first recruited to The City of London reserve unit in November 1948 and in June 2011 its headquarters moved to Southfields. The unit recruits from all over London, including Wandsworth, southern England and East Anglia.